"Neighborhood exercise" is a term I will use to describe any kind of low-tech exercise you might do if you started at your front door and simply used the streets and sidewalks in your neighborhood as your exercise route. This might be something as basic as walking your dog. Neighborhood exercise is not only appealing to many people, but, I feel it should be encouraged more than it is. Marketing research shows that most people don't care to drive more than 5-6 miles to go to a health club. If the distance is greater than that, generally, they don't maintain a regular exercise program even if they do join. • Convenience: It's a lot more convenient -- and certainly cheaper! -- to exercise in your neighborhood than to join a gym. You don't have to pack up a change of clothes. You don't waste time driving to and from the gym, or waiting on a machine or treadmill once you get there. • You're outdoors: Personally, I'd rather do anything outdoors than inside a crowded gym. If you're on a tree-lined street or path and far away from diesel-powered trucks, the air is fresh and clean. Researchers from the University of Michigan have shown that your brain reacts differently to urban environments vs. natural outdoor environments. The relaxing aspect of walking in a natural environment gives your brain a chance to recharge (Berman MG, et al. 2008). • Health benefits: Exercise recommendations for otherwise healthy adults are to obtain 30 minutes of moderately-intense exercise on at least 5 days per week. 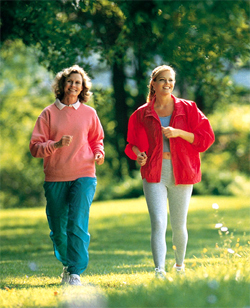 Most often, "moderately-intense" exercise is described as brisk walking. Also, getting 15-30 minutes of sunlight (on your skin) is enough to activate vitamin D in your body which, surprisingly, many people are lacking. Thus, outdoor exercise can improve your health in a variety of ways. • "Green" Exercise: You may not have heard of "green" exercise. This term has been used to describe outdoor exercise...ie., interacting with nature. It was coined in 2003 by Jules Pretty, PhD, and Jo Barton, PhD, at the University of Essex in the UK (see: www.GreenExercise.org). It turns out that exercising outdoors -- in natural places -- has positive effects on your mood. Dr. Barton and Dr. Pretty have published dozens of studies on this. They have shown that exercising in "green spaces" has a positive effect on mood regardless if that space is in an urban setting (think of Central Park in New York City), or, in the wilderness (Barton J, et al. 2010). Researchers in South Korea had college students walk once per week in an on-campus forest (and one additional walking session per week) and found a significant improvement in depression (Bang KS, et al. 2017). The effect of exercising in nature is even more pronounced if near a body of water (Barton J, et al. 2010). The potential benefits that exercising in nature has on depression are so significant that the term "forest therapy" has evolved (Lee I, et al. 2017). • Meet new people: Ever notice that when you're walking or jogging in your neighborhood that other people seem to be more likely to smile and say hello? Of course, if you are racing along on the sidewalk on your bike or rollerblades, then you might make some enemies with people who are just walking. But, certainly you're more likely to meet new people if you're outside as opposed to sitting on the couch in your house. You'll be surprised how your motivation changes when you set new goals. For example, it could be as simple as increasing your daily walk by 1 minute each day. Or, to make the same daily route more interesting, tell yourself to keep walking until, for example, you spot 5 people jogging, or identify 3 houses with bikes or vehicles with bike racks parked in front. (Now you've located some potential new exercise partners!). If you live in an urban area, keep going until you locate a new coffee shop or bookstore or art gallery. Wearable fitness gadgets have gotten very popular in the past few years. So, not only do you have the option of a pedometer or a heart rate monitor, but, fitness bands you wear on your wrist, and, even exercise clothing now has sensors that can give you feedback on your current level of activity. There are several brands of vests with pouches so you can add weights. Wearing a vest like this can add a new dimension to your routine. It will increase your workload, and, in turn, how many calories you burn. If you are looking for groups to exercise with, check local magazines or the web site Meet Up for walking clubs, hiking clubs, biking clubs, rollerblading events, neighborhood 5-K's, etc. You can also stop by a local bike shop or tennis pro shop and ask about group events in your area. • Baby Boot Camp (www.BabyBootCamp.com) caters to moms with young infants. (It was originally launched in 1997 under the name StrollerFit; the name was changed in 2001.) It is now a national franchise. It promotes exercise for moms with newborns and infants. According to their web site: "StrollerFit instructors hold nationally-recognized fitness certifications and are infant and adult CPR-certified. They are also specially trained and certified by StrollerFit. Many instructors have advanced academic degrees in health sciences, fitness and physical therapy." Walk With A Doc: www.WalkWithADoc.org. If you took neighborhood exercise to the extreme, you'd have what is called "parkour." The name means obstacle course in French and the goal of the sport's traceurs, also known as freerunners, is to run, jump, vault, or climb over obstacles such as park benches, fences, trash containers, shrubs, etc., in the most fluid manner possible. Generally, parkour is practiced in an urban setting, where there are more elements to work with. Since its inception in 1987, it has spread internationally, with groups in Brazil, Britain, Canada, Sweden and the United States. In the US, California has the most, followed by New York and Massachusetts, with a large contingent in Maryland and Virginia. Some of the competitors on the TV show "American Ninja Warrior" participate in parkour.